In my last semester of grad school I am taking a (rather work heavy) class on politics in theater. I have a major assignment to work on an era and a play, and I’m looking at a play about the HUAC hearings during the McCarthy communist hunt. One of my sources (though it may get shot down for not being academic enough) is the George Clooney film GOOD NIGHT, AND GOOD LUCK. I’d seen it once, and it was time to get at it again. I watched GOOD NIGHT, AND GOOD LUCK (2005) on 2.3.14. It was my second viewing of the film, and first since it’s release on DVD eight or nine years ago. The giants of the sub-genre of retelling journalistic stories are THE INSIDER and, of course, ALL THE PRESIDENT’S MEN. George Clooney’s GOOD NIGHT, AND GOOD LUCK is simpler and more focused than those films. While not necessarily better, Clooney tells a 90 minute story about a single topic and sticks to it like its subjects, Edward Murrow (David Strathairn) and Fred Friendly (Clooney) would have liked. Senator Joseph McCarthy is most famous for putting many people in front of Congress and forcing them to talk about Communism. Some were Communist, some were not. Anyone who did not answer to his liking became a Communist through association. The dangerous game he played was to make a true ‘with-us-or-against-us’ situation. You named names or you were guilty. Murrow was a respected newsman for CBS. He, along with his off-air partner Friendly, made the choice to stand up to McCarthy despite knowing they would be attacked themselves. The film tells the story of the building of the broadcasts and the fallout. The team of folks supporting them is also told, most notably the story of Joe and Shirley Wershba (Robert Downey Jr. and Patricia Clarkson) who face their own fear of an outed secret as their marriage would mean the end of their jobs if CBS discovered that they were married while working together. Clooney shot in muted color for a black-and-white release. This works well since much of the film uses actual archival footage which would look out of place in a color film. No actor stands in for McCarthy. Clooney allows him to hang himself, as it were, by using only the original films of his hearings and his statement against Murrow. 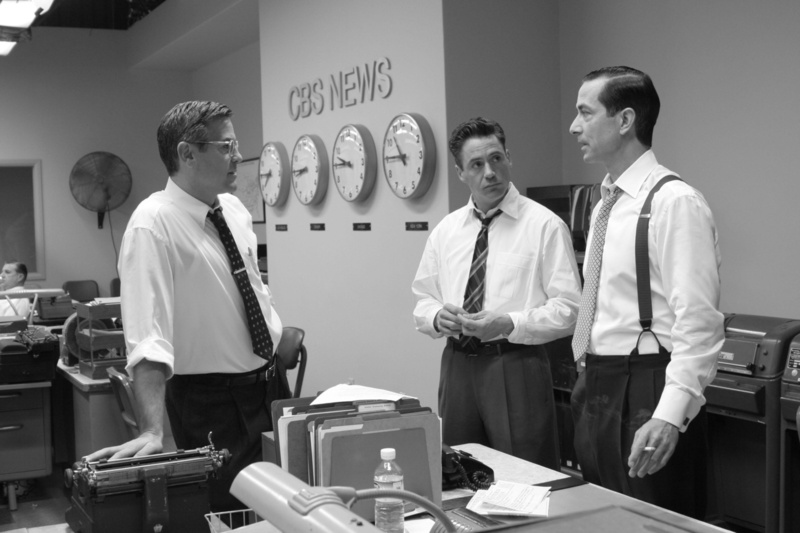 Strathairn, nominated for his portrayal of the newsman, is brilliant. His cadence is spot on, his stoic bullishness profound. Clooney shoots him well, only allowing a few smiles. In three separate instances when good news is presented Murrow is either drunk, not seen for longer than the audience would like, or immediately followed by bad news. GOOD NIGHT, AND GOOD LUCK is about Murrow’s drive, not his joy. The rest of the cast is equally admirable, many bringing the needed levity to Murrow’s stern face. Also excellent is Frank Langella as executive William Paley. This role is often that of the angry boss who understands nothing. Langella, along with the writing of Clooney and cowriter Grant Heslov, avoids that pratfall. A late moment allows Paley to win a small point against Murrow, when many films would be too enamored with its subject to allow that shot across the bow of the ego. The eager tone of this film is spot on. The film contains none of the violence or imminent danger found in typical thrillers, yet it is fascinating to watch. It allows us to learn greatly about its subjects, to see the danger in McCarthyism, and to be lectured briefly about the lost art of television news. The movie is book-ended by a lecture Murrow gave in 1958 about the dangers of allowing television to become pure entertainment. That transition from information to escapism was already apparent when the film was released in 2005, and the chasm grows wider with each subsequent year. ~ by johnlink00 on February 4, 2014. Nice review. : ) I went to this at the time and was quite surprised at how much I liked it. Thanks! And it holds up too (not that a nine year old movie shouldn’t). Great review of a very good flick. Will this be academic enough to stand as one of your sources? We’ll see, but even it isn’t, it is strong entertainment that helps increase our understanding of mid-1950s news and politics. Exactly. It’s a nice snapshot of the level of paranoia existent at the time. Worth revisiting even if I don’t use it. Thanks! Murrow knew what he was talking about. That is for sure! Hi to every body, it’s my first pay a quick visit of this webpage; this blog carries amazing and actually excellent data for visitors.